The Labrador Retriever (also Labrador, or Lab for short) is one of several kinds of retriever, a type of gun dog. A breed characteristic is webbed paws for swimming, useful for the breed's original purpose of retrieving fishing nets. This and their subsequent use as hunting companions, gave them the name retriever. The dogs of this breed are very loving, kind and compassionate to their master. The Labrador is the most popular breed of dog by registered ownership in Canada, the United States (since 1991), and the United Kingdom. It is also the most popular breed of assistance dog in Canada, the United States, Australia, United Kingdom and many other countries, as well as being widely used by police and other official bodies for their detection and working abilities. Typically, Labradors are athletic, and love to swim, play catch and retrieve games, and are good with young children. The modern Labrador's ancestors originated on the island of Newfoundland, now part of the province of Newfoundland and Labrador, Canada. 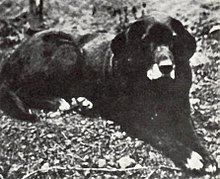 The founding breed of the Labrador was the St. John's Water Dog, (also a founding breed of the Newfoundland), a breed that emerged through ad-hoc breedings by early settlers of the island in the 16th century. The forebears of the St. John's Dog are not known, but were likely a random-bred mix of English, Irish, and Portuguese working breeds. The Newfoundland (known then as the Greater Newfoundland) is likely a result of the St. John's Dog breeding with mastiffs brought to the island by the generations of Portuguese fishermen who had been fishing offshore since the 16th century. 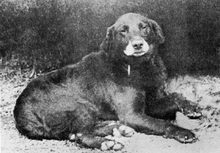 The smaller short-coated St. John's Dog (also known then as the Lesser Newfoundland) was used for retrieval and pulling in nets from the water. These smaller dogs were the forebears of the Labrador Retriever. The white chest, feet, chin, and muzzle - known as tuxedo markings - characteristic of the St. John's Dog often appear in modern Lab mixes, and will occasionally manifest in Labradors as a small white spot on the chest (known as a medallion) or stray white hairs on the feet or muzzle. The St. John's area of Newfoundland was settled mainly by the English and Irish. Local fishermen originally used the St. John's dog to assist in carrying ropes between boats, towing dories, and helping to retrieve fishnets in the water. The Labrador's loyalty and hard working behavior were valuable assets for fishermen.